I read somewhere that they thought this novel would make a great film and I utterly agree. The Forgotten Seamstress has great visual components - the descriptions of the buildings alone that would make a fascinating backdrop for a movie. I read it quickly because I was desperate to find out if Maria’s history would be believed and her child’s identity would be discovered in Caroline’s modern day storyline. The transfer back and forth between Maria’s voice and Caroline’s was seamless and so well done that you felt like they were living during the same period despite that they obviously weren’t. And the pace was perfectly executed too, everything introduced at the perfect time with just enough description to create a picture but never enough to slow down the information. I’m gushing I think- but to be honest it was a greatly enjoyable read in every aspect from the way it was written to the story itself. The concept of the quilt throughout the plot was fabulous, each snippet of information we got about Maria was also shown in a portion of the blanket she was making throughout her life and as we learnt more about Maria’s later life we were given a clearer image of the blanket. I’m positive though that everyone’s vision of the quilt would be different! Liz Trenow also was careful that the emotions between characters was clear, that Caroline’s struggle with her mother’s future was not left as an after-thought and that Maria and Nora were never far from each other’s minds. I felt like nothing was left by the way side and every detail was thought through and wrapped up with satisfaction. 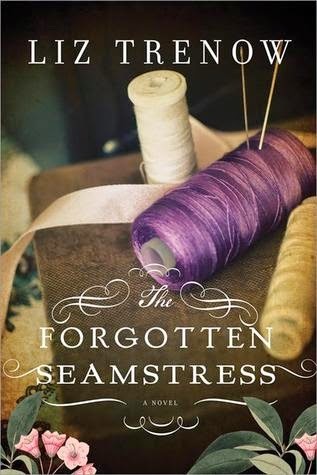 Though The Forgotten Seamstress is peppered with sadness there was still an element of joy and positivity that stuck with me throughout. I really enjoyed it and am certainly putting Liz Trenow on my list of author’s to seek out!